A woman caught on camera in Yonkers violently picking up a 6-month old pit bull puppy and throwing it has been arrested for animal cruelty following an investigation by law enforcement officials. The SPCA of Westchester announced on Thursday that following a joint investigation by their Humane Law Enforcement Unit and the Yonkers Police Department, they have arrested Kiani Wright, 43, after she allegedly injured the puppy, which required medical attention. 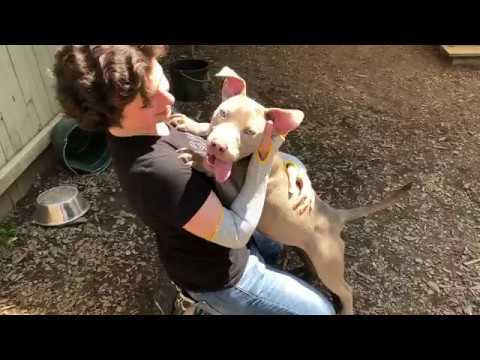 SPCA officials said that a Good Samaritan called the Yonkers Police Department on May 13 after the pit bull - whose name is Pebbles - was seen being dragged then violently picked up by her neck and thrown outside of an Intervale Place apartment complex. According to police, the SPCA was called in to further investigate and it was determined that she needed to be transported to a veterinarian for medical attention. During her examination, it was discovered that she was suffering from a fractured tooth and abrasions on her chin. During the investigation, the SPCA’s Humane Law Enforcement Unit was able to obtain video from a nearby surveillance camera that revealed Wright was responsible for Pebbles’ injuries. She was quickly apprehended and charged with animal cruelty. Pebbles is now at the SPCA, where she will be placed up for adoption.